A Bristol native, Charles M. McCarthy retired in 1979 after serving as Sports Editor of the Bristol Press for a remarkable 45 years. During this period, his writings brought him many friends and honors, including the recognition of being one of Bristol’s best known citizens in New England. A die-hard Boston Red Sox fan, he enjoyed visiting Fenway park whenever possible. 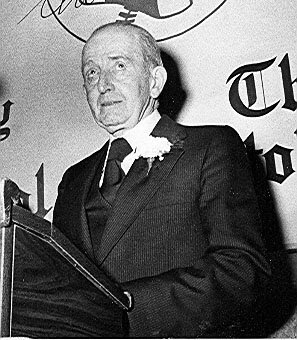 When he passed two years after his retirement, McCarthy was recalled for his wit and numerous contributions in news coverage of Bristol’s greatest athletes and events. His writings provide Bristol with a first-rate documentation of its rich sports past. His longevity and dedication to the local media will likely never be surpassed.